This post comes courtesy of my friend Nat (a.k.a., Natural), who is probably one of the most amazingly talented individuals I have the privilege of calling my friend. Besides being an educator, he is a musical artist, and “State of Grace” is his latest, greatest project. I’ll leave the rest of the post in his words. Please spread the word via Twitter, Facebook, Instagram, smoke signals…however you choose to interact with the world. Thanks for taking the time to read this! It has been almost six months since the Boston Marathon tragedy. In the time since Patriot’s Day, I have spent a huge amount of time reflecting on and thinking about the state of our wonderful city. From personal connections to the tragedy itself, to the ongoing search for answers during the aftermath, the journey since April has been an arduous one for many. Though tragedy, loss and sorrow have certainly had their place, hallmarks of community have constantly been on display: Remarkable acts of kindness, generosity, empathy and peace. It is from witnessing these amazing acts from my community in which I drew inspiration for the song “State Of Grace”. The same elements of community that inspired “State Of Grace” are best exemplified in the memory of Martin Richard. Boston’s proud son was a wonderful little boy who was taken from us far too soon. The unforgettable image of Martin holding a sign urging “peace” serves as an unbelievably strong message and source of inspiration. 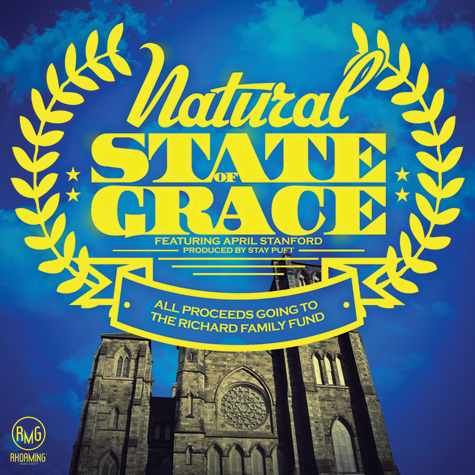 “State Of Grace” aims to honor Martin Richard’s memory and to carry forth his philosophy for peace. ALL PROCEEDS will be donated to the Richard Family Fund. (http://richardfamilyfund.org/) Additionally, there will be a benefit concert in the coming months. We are asking for your help generating awareness and spreading the word in any way you can. Any and all help would be greatly appreciated. Your past, present and future support is held in the highest of regards. I felt this was the best way I could give back to a community that has inspired me so much. Love, blessings and peace from Boston, Massachusetts.